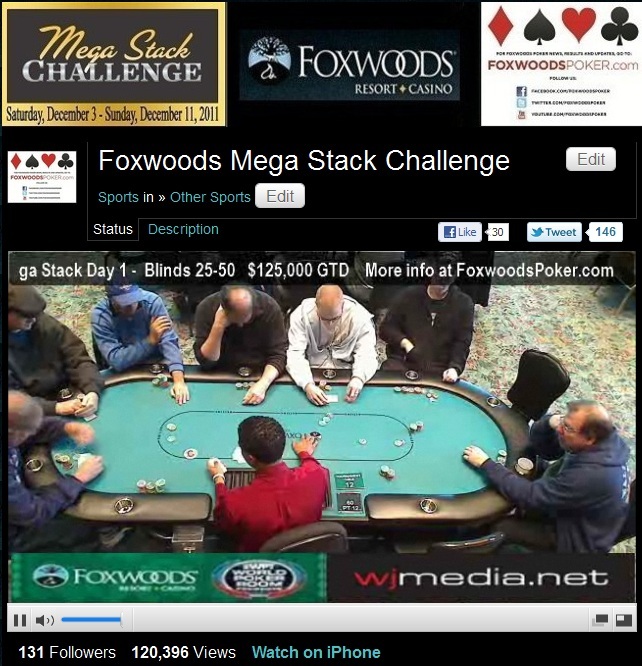 The players in the $600 Mega Stack Challenge are now on a 10-minute break. There are currently 45 players remaining with the top 40 spots finishing in the money. The average chip stack is now 196,000 and the blinds will be increased to 4,000-8,000 with a 1,000 ante. There are now just 64 players remaining in the $600 Mega Stack Challenge event. The blinds are now 2,500-5,000 with a 500 ante and the average stack is just under 138,000. The final 40 will finish in the money. The players in the $600 Mega Stack event are now on dinner break until 7:30pm. There are 130 players remaining and the average stack is now 67,800. Tonight's nightly tournament at the Mega Stack Challenge Series is the $180 N0-Limit Hold 'em Deep Stack event. There is a $15,000 guaranteed prize pool and the tournament kicks off at 6pm. We had a total of 353 players in the $600 NLHE event at the December Mega Stack Challenge. Currently over 330 Players in the $600 Mega Stack! With registration still open for today's $600 No-Limit Hold 'em Mega Stack Challenge event, there are already over 330 players in the field. The blinds have just been increased to 75-150. $600 Mega Stack Event Now Streaming Live! The $600 Mega Stack Challenge event is now underway. Players start with $25,000 in chips and there is a $125,000 guaranteed prize pool in this event. The blinds will start at 25-50 and Levels 1-8 will be played for 30 minutes, Levels 9-17 will be played for 40 minutes and Level 18 and up will be played for 50 minutes. The $600 Mega Stack Event Just 30 Minutes Away! The first event in the December Mega Stack Series, the $600 No-Limit Hold 'em event, kicks off at 11am. For a full schedule of the December Mega Stack events, just click HERE.